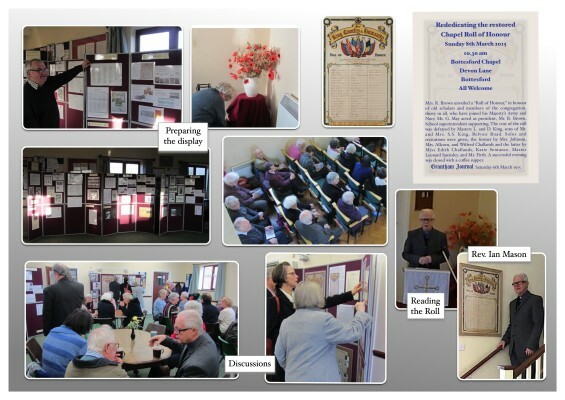 At the centenary of its unveiling in 1915 the recently conserved Bottesford Methodist Chapel 1st World War Roll of Honour was redisplayed and rededicated. The Reverend Ian Mason introduced a short ceremony as part of the regular Chapel Sunday Service. He then read out all the names on the Roll of Honour before moments of quiet reflection. Afterwards a near capacity congregation retired to the Meeting Room to view a display describing the programme of conservation and how it fitted in the Bottesford Parish 1st World War Centenary Project. The ceremony and display provoked lively discussion. Many commented how much it had increased awareness of the contribution made by the then Bottesford Primitive Methodist Chapel worshippers who served in the 1st World War. The conservation was possible with the support of the Heritage Lottery Fund and was carried out by an accredited conservator, Lorraine Finch (http://www.lfcp.co.uk/). An excellent Facebook page provides details of her meticulous work (www.facebook.com/LFCandP).